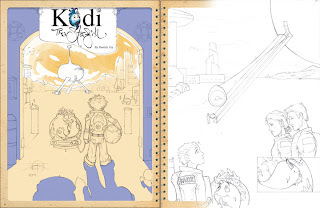 This is just a quick update to show some new progress and to let you know that I am still here, just crazy with Kodi! 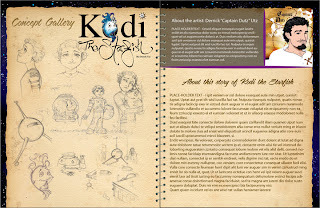 Here is a new intro spread that I am designing to go in to the digital version of Kodi's "Setting Free" short story. I am also discussing it with the team over at Illopond to see if they want to format the Bio-Intro information for every contributor of their "8 in Spaaaaaccee" anthology like this. It is designed to look like an old storybook in space!! 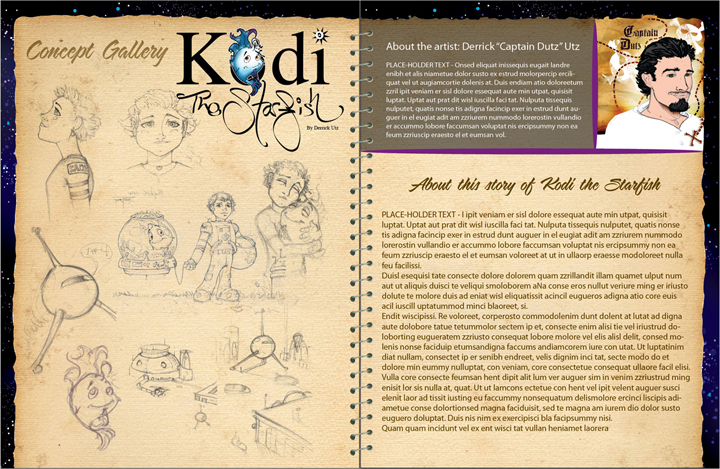 This is the intro spread with a concept gallery on the left and the bio and story establisher on the right. Then they would go straight into the story well prepared (following spread). I am finished with the line work of the 8 pages and have now started the digital painting as you can see with page 1 on the left side of the second spread. Thank you all for looking in and I will post more soon!!!! Best be to yeee, Yo' Ho'!! !